Easywalker unveiled a delightful new stroller at the Kind + Jugend 2017 expo in Cologne. 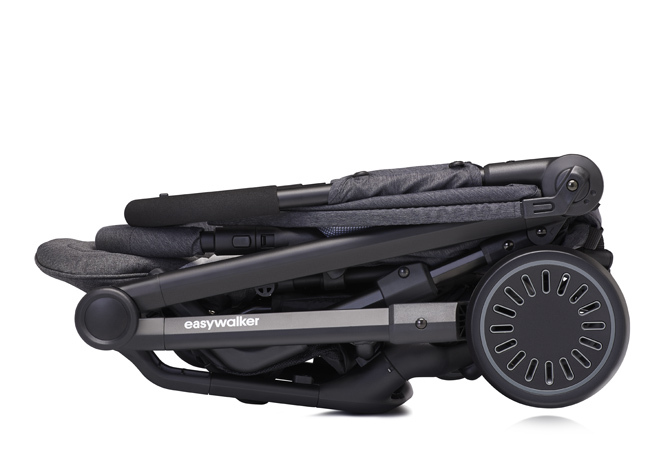 The Easywalker Buggy XS is the most compact stroller in the brand's lineup. This fashionable buggy packs an extensive list of beautifully designed features and meets all my needs and requirements for a travel stroller. 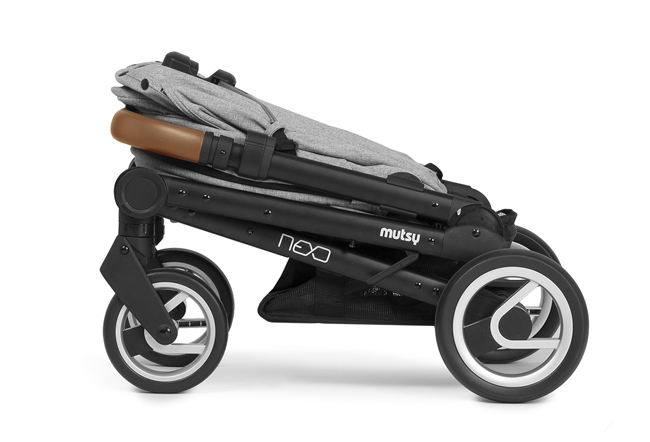 The one-handed, tiny fold, makes this buggy a perfect traveling companion. A flat seat recline and an adjustable leg rest creates a comfortable sleeping surface. The buggy is equipped with all-wheel suspension for a smooth ride and provides good sun coverage and ventilation for warmer climates. 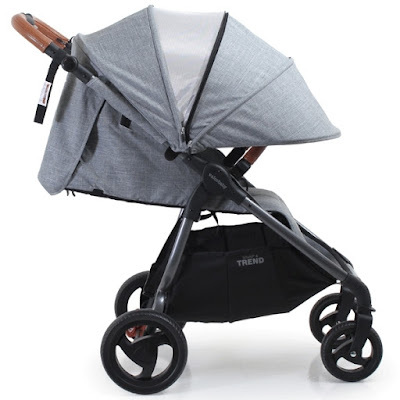 Comfortable, high quality textiles and attractive design makes this little stroller stand out from the crowd. The Easywalker Buggy XS is truly the 'Rolls Royce' of travel strollers! 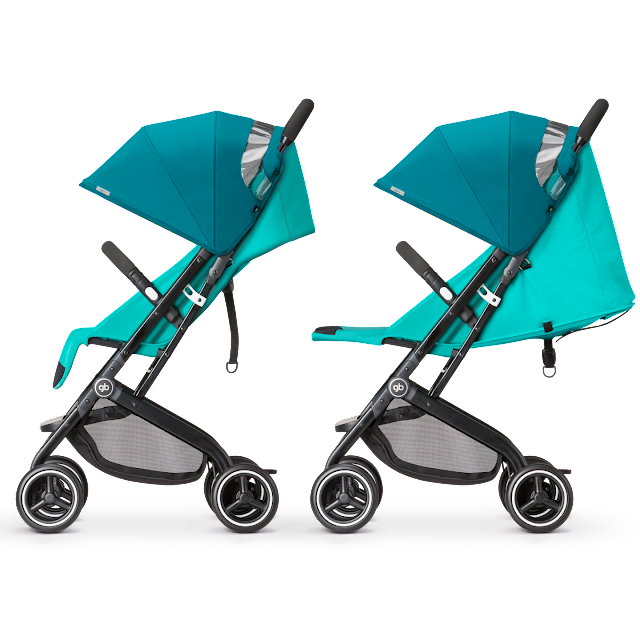 The Buggy XS will be available in two beautiful color schemes, Monaco Apero and Berlin Breakfast. 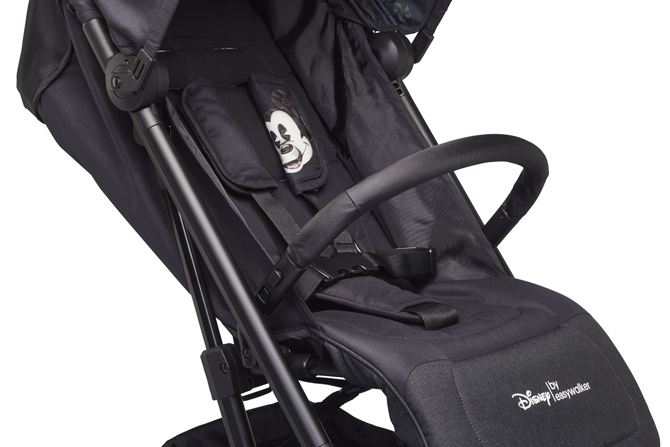 In addition, Easywalker has once again joined with Disney to create XS buggies, featuring an iconic Mickey Mouse design. These will be available in 3 upholstery options: Mickey Ornament, Mickey Diamond and Minnie Ornament. 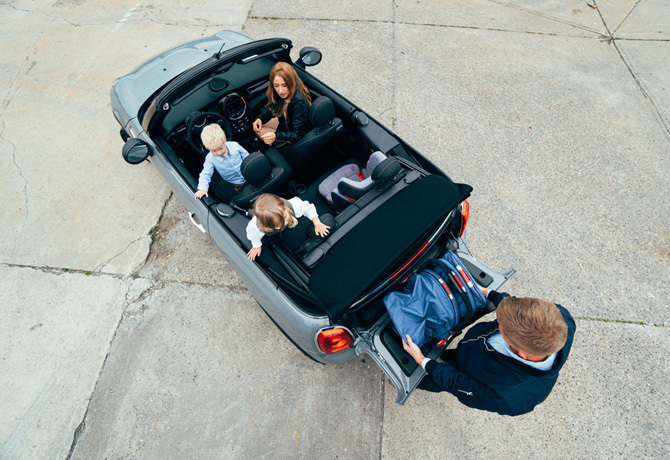 Finally, in collaboration with MINI of BMW Group, Easywalker brings us the MINI Buggy XS. 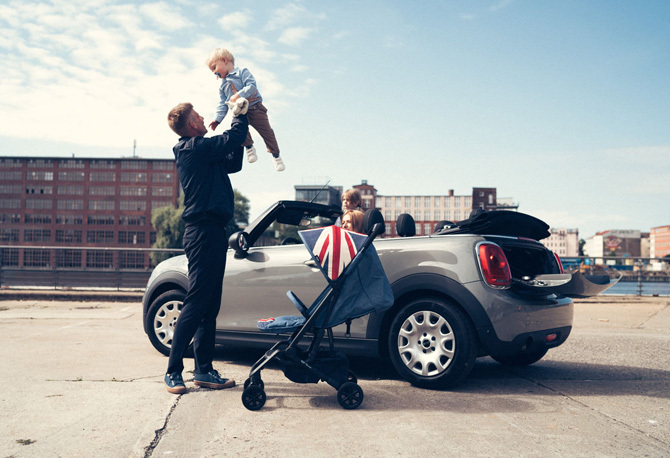 Featuring classic Union Jack designs and iconic MINI details with a bit of extra luxury for your little passengers. 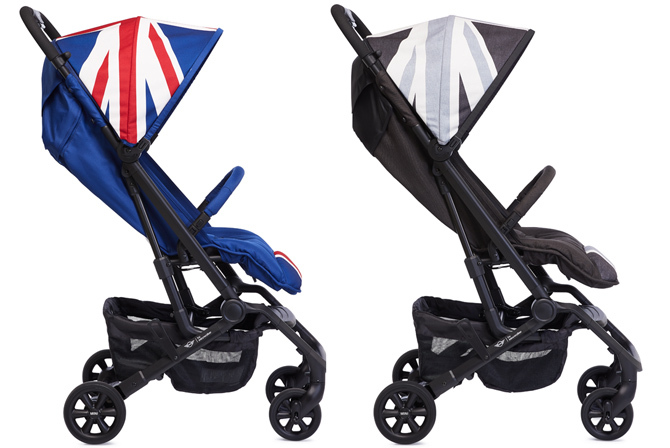 Available in 4 colors; Union Jack Classic, LXRY Black, Union Jack Vintage, Union Jack B & W.
Easywalker Buggy XS is due in stores January 2018 and will retail for € 249.00 - € 290.00. 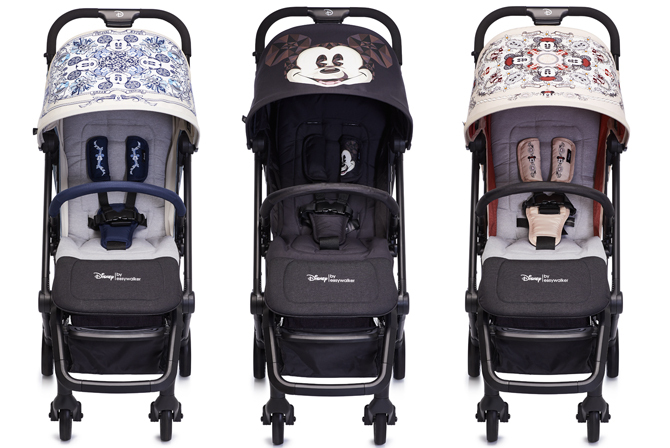 A delightful fusion of Easywalker modern design and quality with Disney's whimsy. Available in 3 upholstery options: Mickey Ornament, Mickey Diamond, Minnie Ornament. 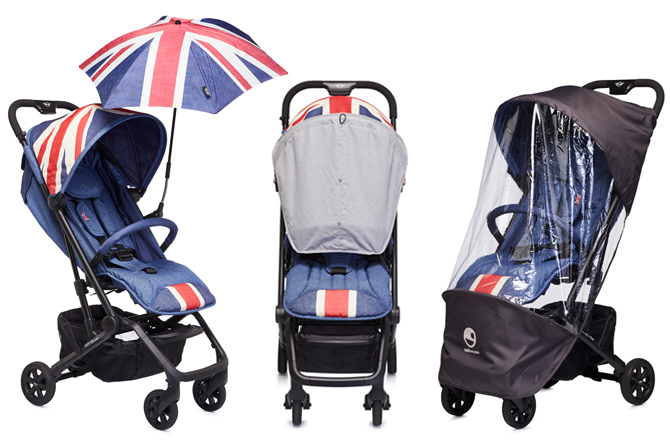 In collaboration with MINI of BMW Group, Easywalker brings you MINI Buggy XS in four iconic color options; Union Jack Classic, LXRY Black, Union Jack Vintage, Union Jack B & W.
It will be some time till I can get my hands on one of the XS Buggies. 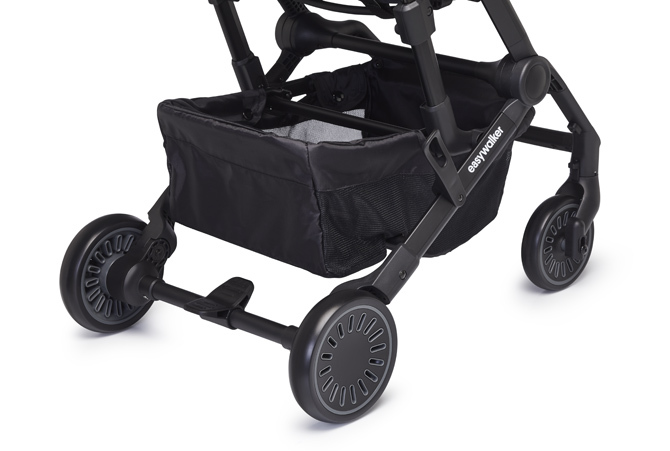 In the meantime, check out my reviews of other Easywalker strollers, because they're all awesome! 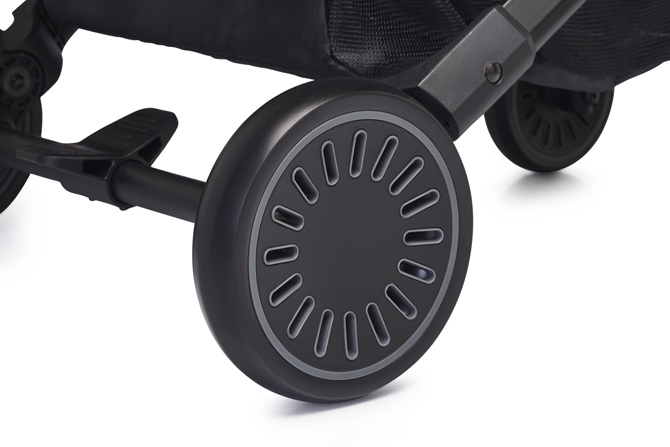 Read all about the Easywalker Mosey/Mini stroller HERE. 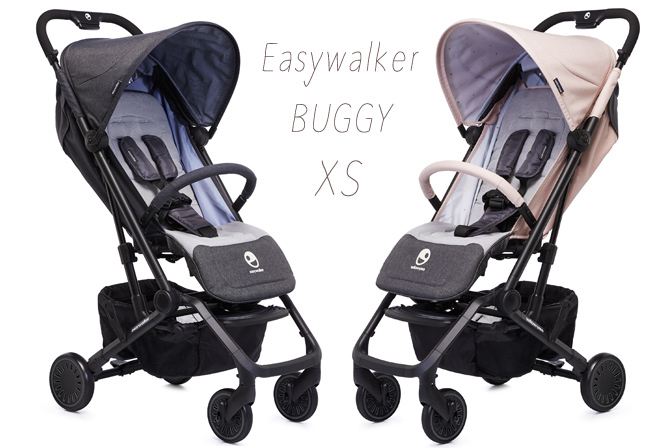 The Easywalker Buggy 2016 and of course the Easywalker MINI buggy XL. I'm a huge fan of lightweight, compact strollers. Partly because these type of strollers are very convenient for city life and partly because I'm petite and prefer not to be encumbered by a heavy, bulky stroller. 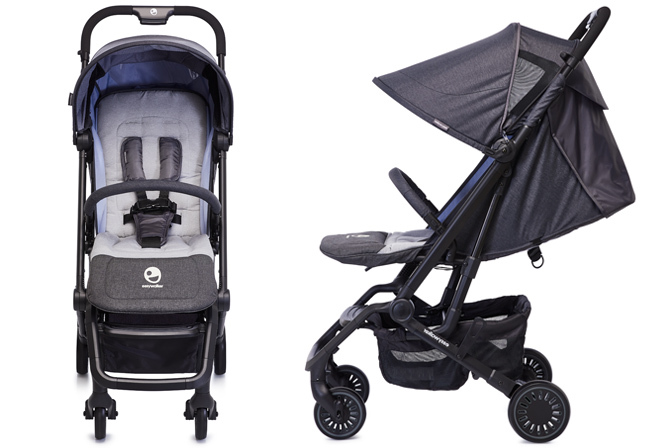 Lightweight, strollers are designed for portability, weight under 18 lbs and generally feature a simple, compact fold. Some people are OK with a lightweight stroller being of inferior quality. Their reasoning being that it's a backup stroller which is only used on specific occasions and therefore doesn't need to be exceptionally wonderful. However, for many city dwellers and frequent travelers, a lightweight stroller occupies the place of a main stroller and therefore needs to have as many comfort and convenience features as possible. My personal standards for a lightweight stroller are very similar to my standards for full size strollers. Just like a full size stroller, a lightweight stroller must be comfortable for a child, provide a good sleeping surface with a deep recline, have high quality textiles, good sun coverage, fold easily and maneuver well. 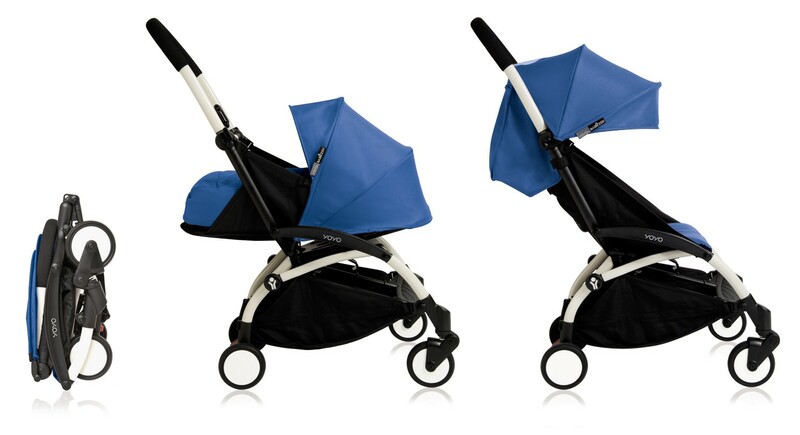 Looks also matter and the lightweight strollers that have a more attractive design get my attention. Of course in a lightweight stroller I have to compromise on the push quality due to smaller wheels. A lightweight stroller will never handle grass and uneven terrain as well as a full size stroller with larger wheels. That just comes with the territory. Lightweight strollers are designed to be mostly used on pavement and indoors (think malls, airports, museums, etc.). Here's my list of the best compact and lightweight strollers for 2017. These strollers were chosen based on the following criteria: Weight, compactness, child comfort features, ease of fold, quality, aesthetics. 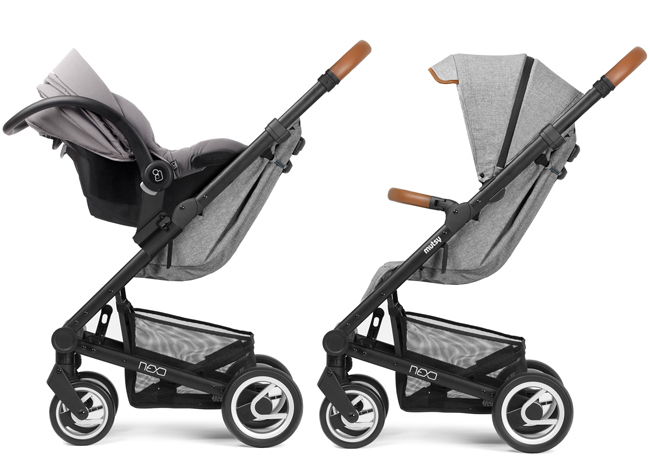 The Mima Zigi, like all Mima strollers, has a cool, futuristic look, with transparent wheels, chrome accents and a fluid seat design. The stroller is a head-turner, but also extremely functional. It seems that the designers at Mima really thought of everything! 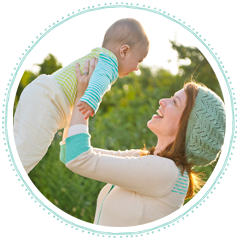 Mima Zigi can be used from birth with an optional bassinet or infant car seat. Zigi will be available in 3 colors. 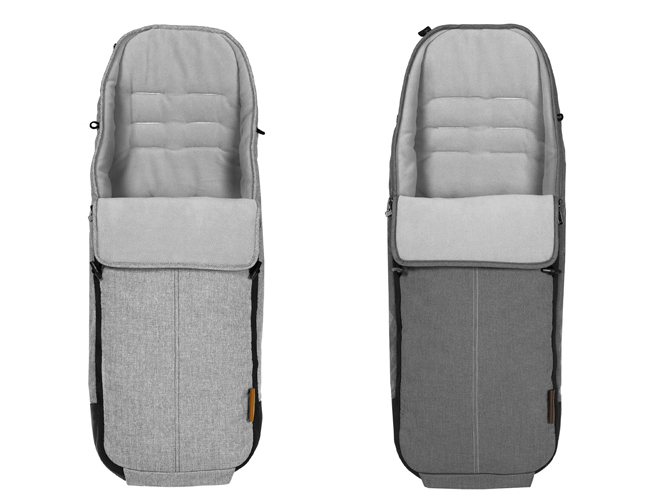 Can be used from birth with a parent facing bassinet attachment or car seat. Weighs 13.7 to 14.5 lbs (6.2 to 6.6 kg) depending on the version. The new Nano V2 folds even more compact than it's predecessor, making it a perfect travel companion. 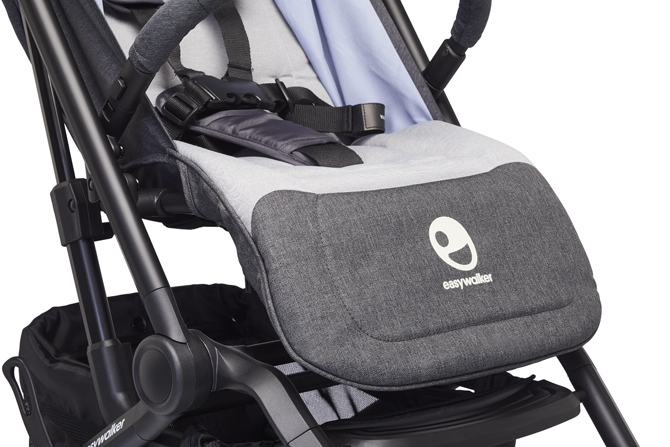 While the stroller is narrow and lightweight, it still features a full size seat, which can be suitable from newborn (with carrycot attachment or car seat) to well into the toddler years. Despite it's small size, the stroller is very stable and sturdy. 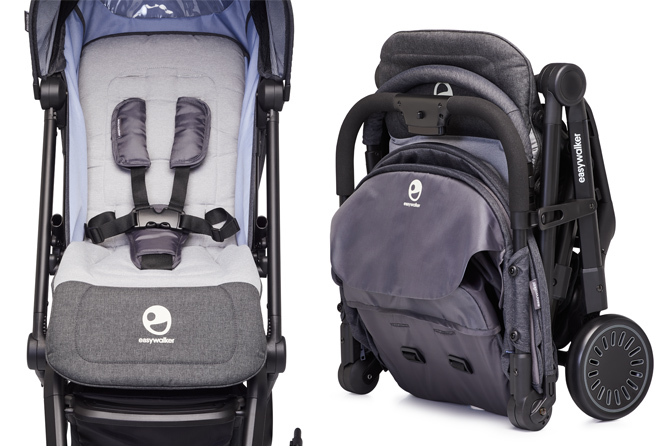 Travel system ready - built in safety belts to secure a car seat no need to purchase additional adapters. 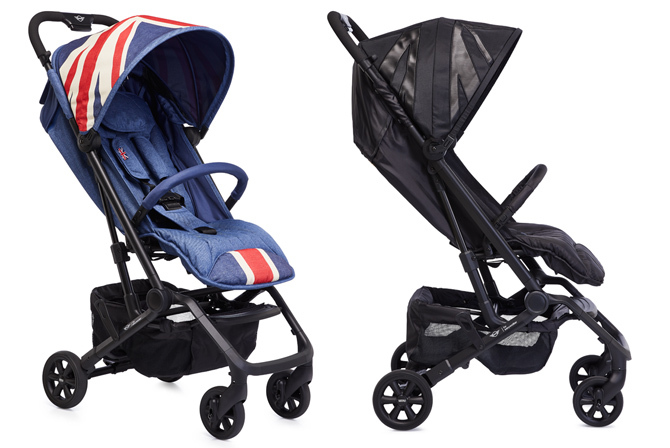 The GB Qbit+ is one of the few lightweight strollers with a completely flat recline, making it suitable for use from birth without an addition of a carrycot or car seat (though the stroller is car seat compatible). It's also one of the few compact strollers which include a bumper bar. Greentom is Dutch stroller brand that will be available in USA for the first time this year. 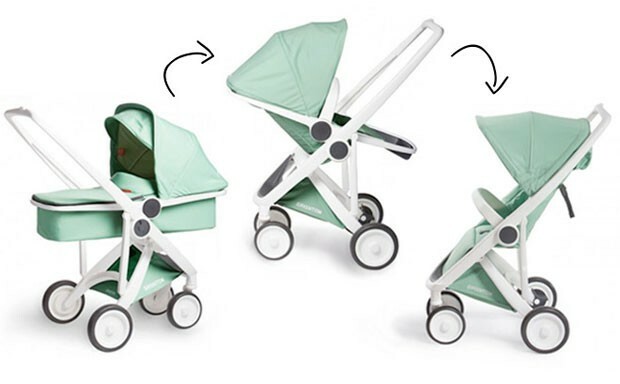 The Greentom Upp is a unique concept in stroller design. Besides for being lightweight and very versatile, the stroller is as green as it gets, being completely made of recycled and biodegradable materials. 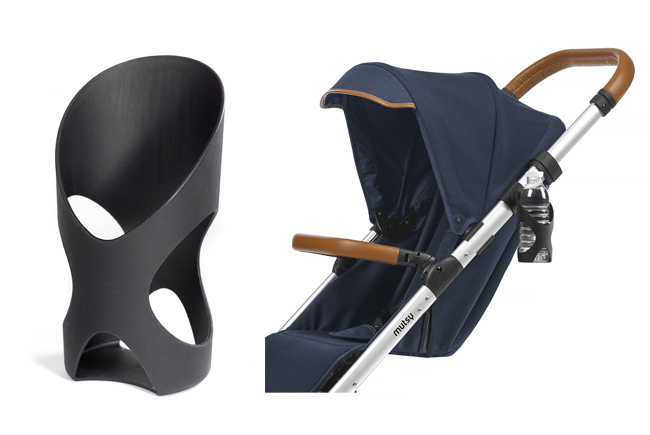 The stroller frame is made of Polypropene and the high quality textiles are made of recycled PET bottles. Greentom Upp is a 3-in-1 stroller. 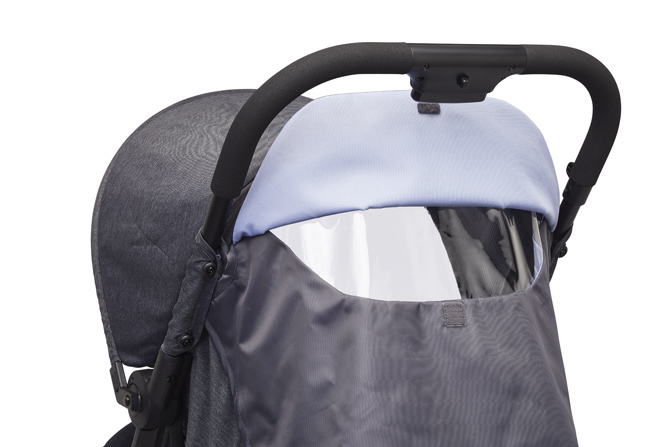 The frame can be used with a classic, forward facing seat, a newborn carrycot or a reversible seat unit. It can also be used as a travel system with an infant car seat. Available in 3 frame colors and 10 vibrant fabric color options. Mios is the newest addition to Cybex stroller collection for 2017. This stroller is a perfect hybrid of compactness with full-size stroller features. While it's in a higher weight category than the other options in this post, it's still under 20 lbs (weighing 19 lbs to be precise) and has a small foot print. 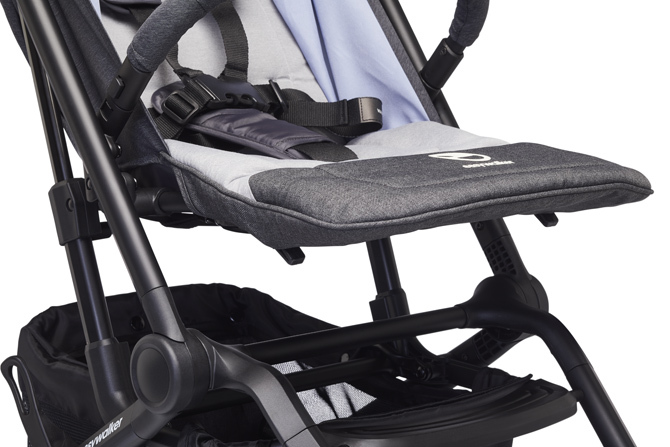 As with other Cybex strollers, Mios has a sleek, contemporary look that will resonate with Urban parents. Available in 7 colors, plus 3 Special Edition fashion prints. 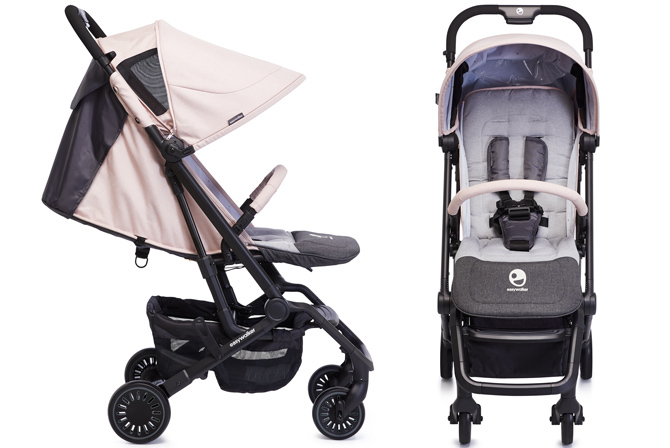 Babyhome Vida is a very lightweight and compact, full featured stroller, that is also very affordable at $299. It features an attractive, fluid design with a slim frame, a compact fold and lot's of thoughtful features. 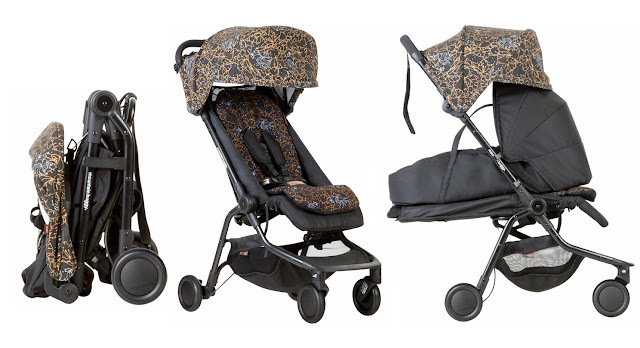 It is one of the few compact strollers with removable and washable seat fabric. Kids are messy, and the ability to wash the stroller fabric offers a degree of convenience rarely found on a stroller in this price-range. 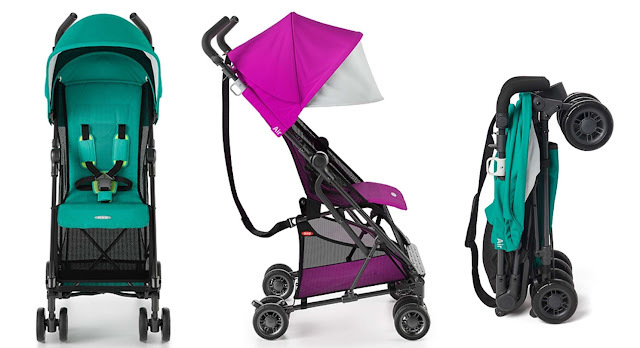 The new Valco Baby Snap 4 Trend is loaded with all the 'full size' stroller features, like a roomy seat, large basket and ginormous canopy, while still being relatively light at under 18 lbs. 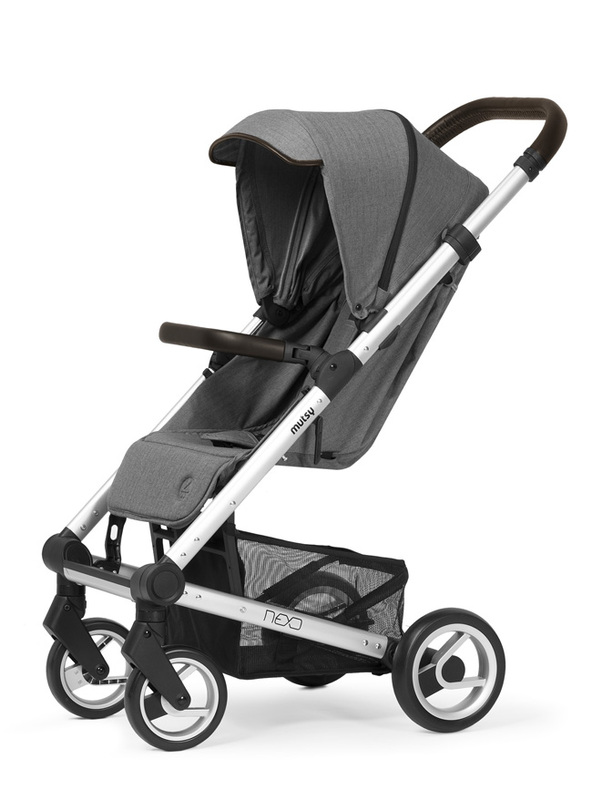 If you like the Oxo Tot Cubby and Cubby+ strollers, you will absolutely love the new Oxo Tot Air stroller! 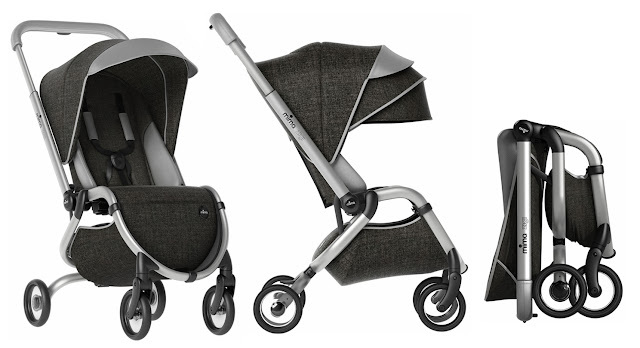 When Oxo designs baby products, they do it right, and this stroller is no exception. At $180, it's one of the most affordable travel strollers on the market. New Mutsy Nexo Colors For 2017! 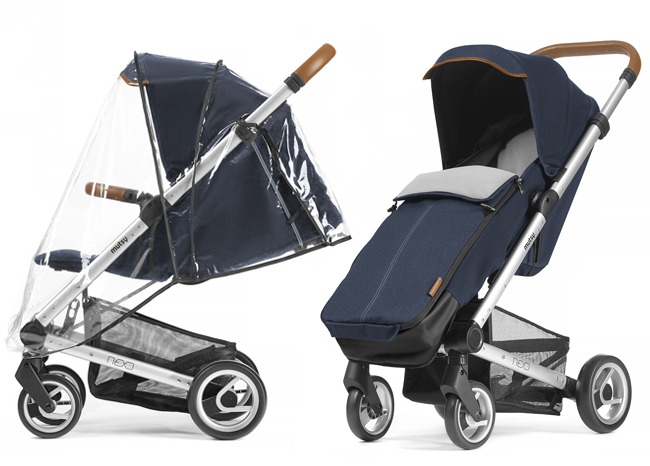 A fantastic new year has arrived and with it, a brand new collection from the Dutch stroller brand Mutsy. 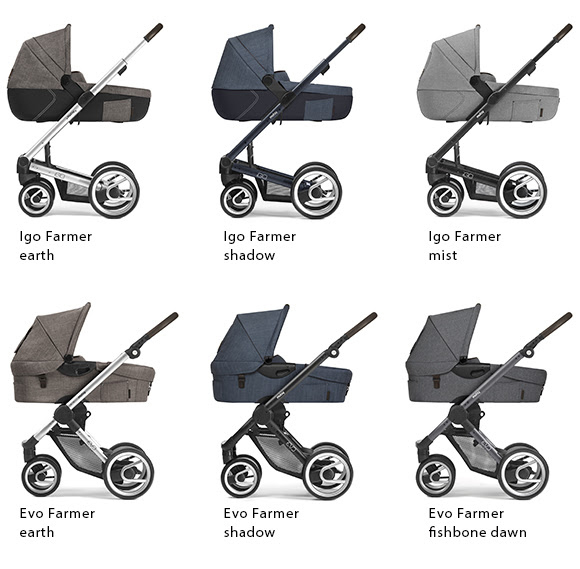 Gorgeous new colors and fabrics have been introduces for all of Mutsy's stroller models - Igo, Evo and Nexo. 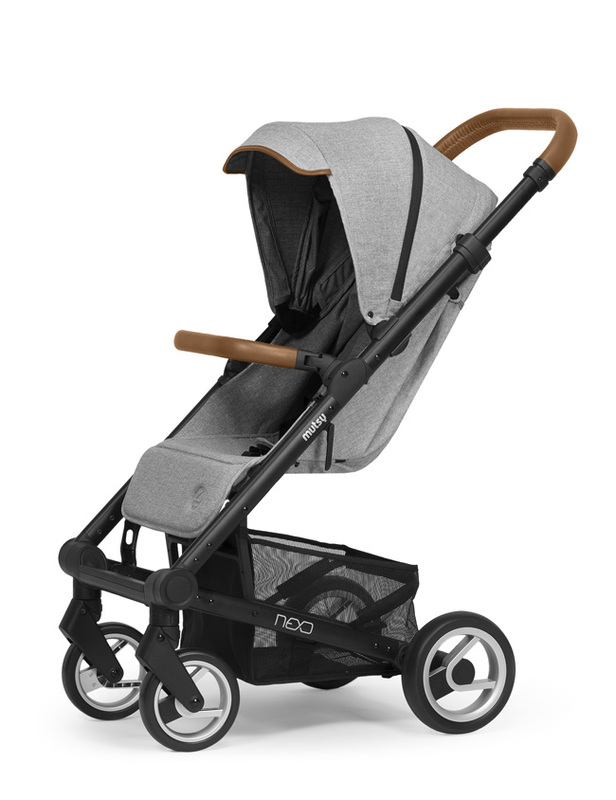 Nexo, the newest stroller in the Mutsy lineup, has been one of the most popular strollers of 2016. It is a hybrid of style, convenience and compactness. For 2017, two new colors have been introduced - Mist Melange on a black frame and Ash Melange on a silver frame. 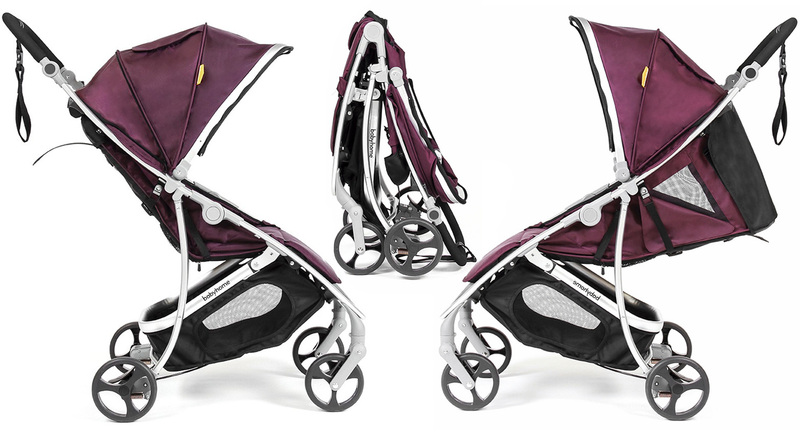 Both color options are accented by leather details, giving the stroller a luxurious and contemporary dimension. Nexo has been created for the Urban lifestyle and the sophisticated new colors, in addition to the 2016 Blue Melange and Grey Melange, fit into the city setting perfectly. You can check out this stroller in action in my 'Out And About With Mutsy Nexo' post from this past Summer. 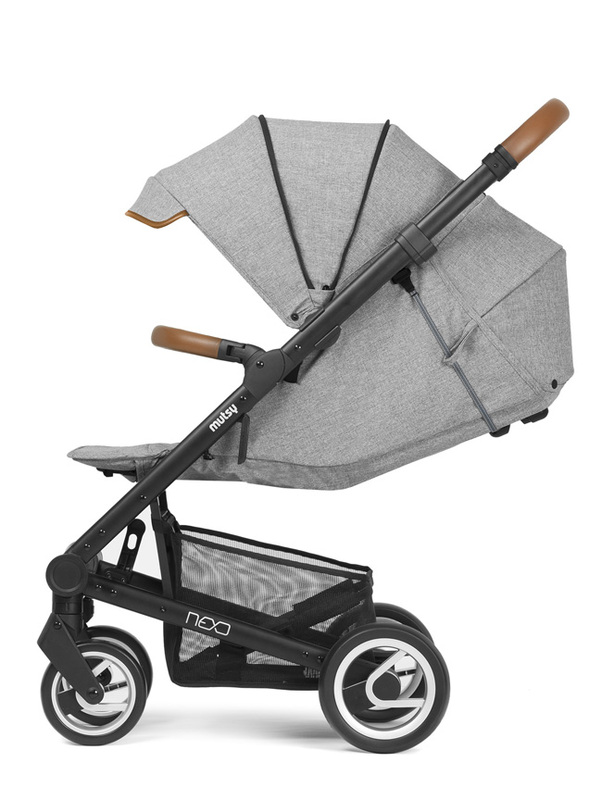 Accessorize your Nexo stroller with car seat adapters, a water resistant warm footmuff with micro-fleece lining, rain cover, and a sleek, modernistic cup-holder. Over the weekend, we had loads of fun, attending the Play Time New York show at the Metropolitan Pavilion in Manhattan. Playtime is an absolutely stunning trade show for children's brands. It runs in Paris, New York, Tokyo and Berlin. 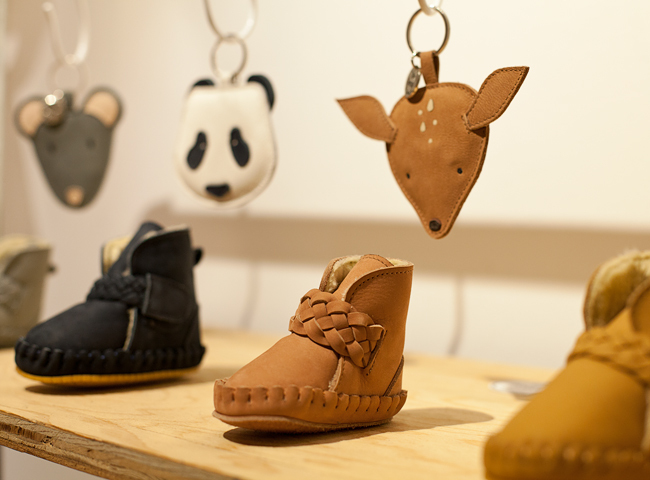 The New York show featured 180 international and local exhibitors, displaying kids and baby fashion, shoes, accessories, nursery decor, toys and gifts. I've been to other trade shows before, but this was my first time attending Playtime, and I was so impressed with how beautiful and pleasant it was. The atmosphere was calm and every single booth was a small magical place to be discovered. There was a feeling of authenticity and community at the show. A lot of the businesses were family owned and manufactured their products in their home-towns with an emphasis on quality and sustainability. There were also plenty of hand-made businesses, which I'm always a big fan of. 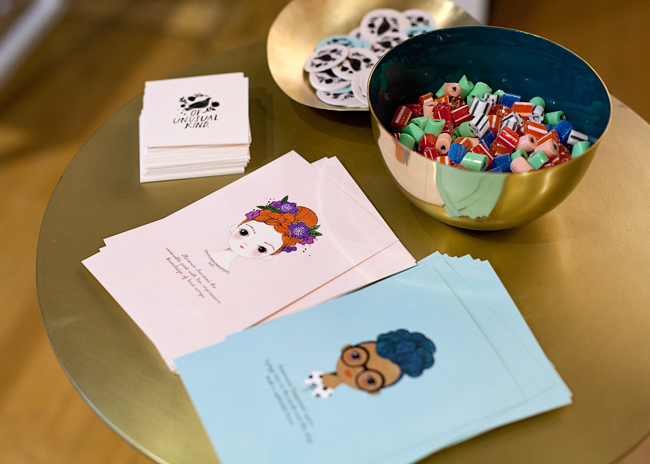 Most of the booths were represented by the actual owners, artists and designers of the brands and it was really great to see the face behind the creative products and learn their individual stories. While every booth was extremely attractive, here are some exhibitors that stood out for me. 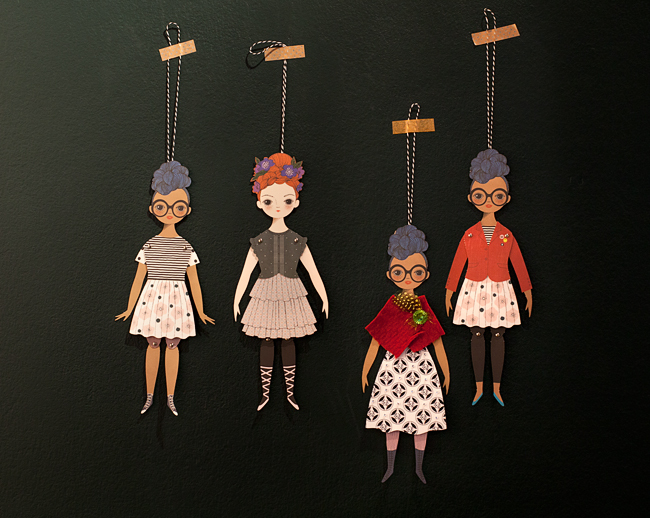 OF UNUSUAL KIND - Is a collection of whimsically modern paper dolls, created and hand illustrated by Anja Kroencke in New York. 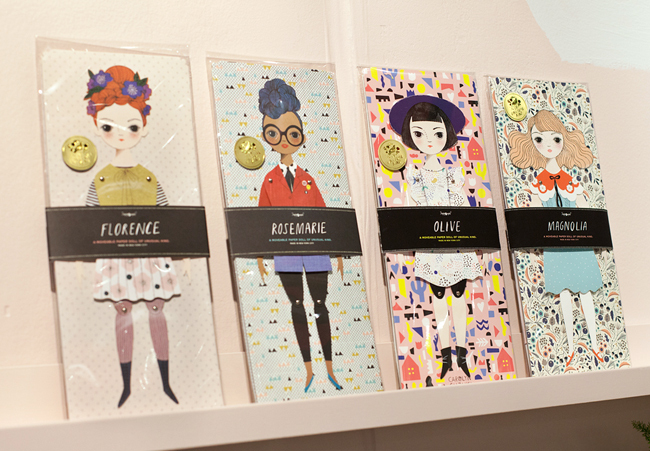 Of Unusual Kind is a celebration of paper craft, exquisite pattern and unique, individual style. 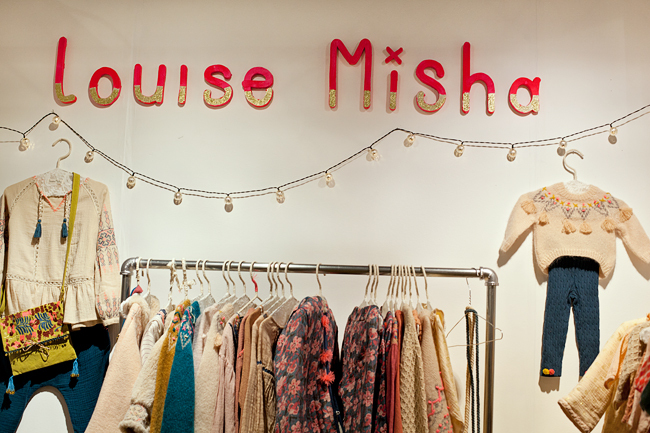 LOUISE MISHA - Created by two friends and inspired by travels, the brand features bohemian, nostalgic fashions for babies and kids. At the request of many mothers, there's now also a women's collection in the same distinct style. KALINKA - Based in Bulgaria, Kalinka is a brand of classic, hand-knitted garments for babies and kids. The softest Merino wool, imported from Peru, is used to knit Kalinka styles. Each piece is made with love by Bulgarian grandmothers, utilizing centuries-old traditions passed down through generations. 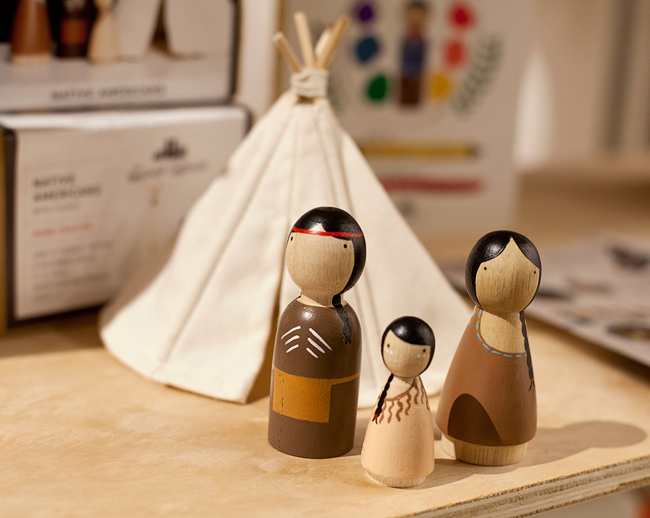 GOOSE GREASE - Family owned and run business, based in Brooklyn, NY, Goose Grease creates wooded dolls, made of sustainably harvested wood, hand-chiseled and hand-painted. 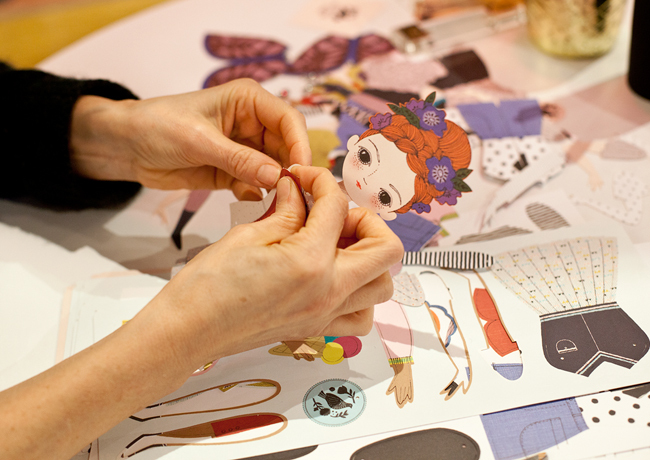 All materials used in production are non-toxic and water based, making these dolls safe for kids of all ages. 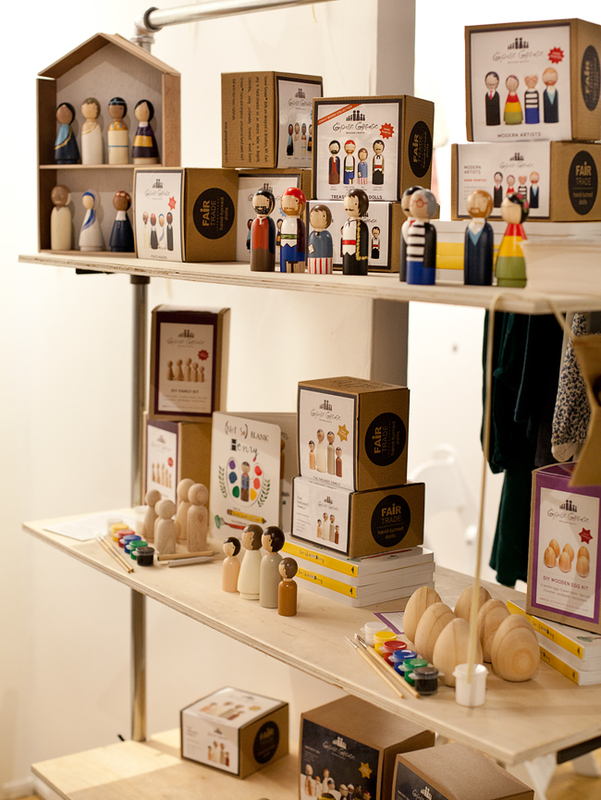 There are many doll collections to choose from and your kids can even paint their own family of dolls! 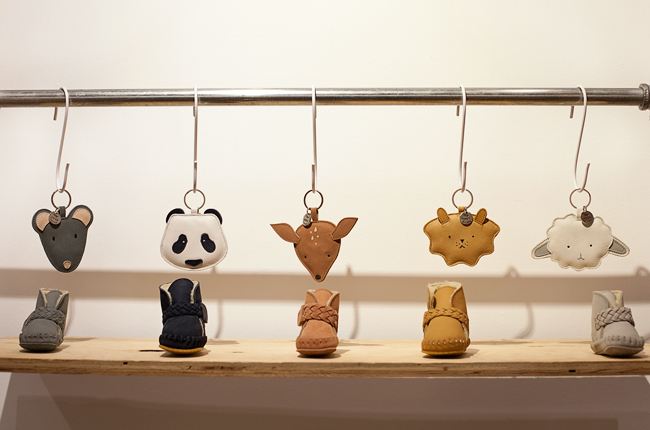 EASY PEASY - Is a French brand of stylish baby shoes and accessories. The collection is eco-designed, utilizing vegetable-tanned, chromium free leather, water-soluble glue and organic cotton packaging. The shoes are flexible and buttery soft, ensuring perfect comfort for little feet. 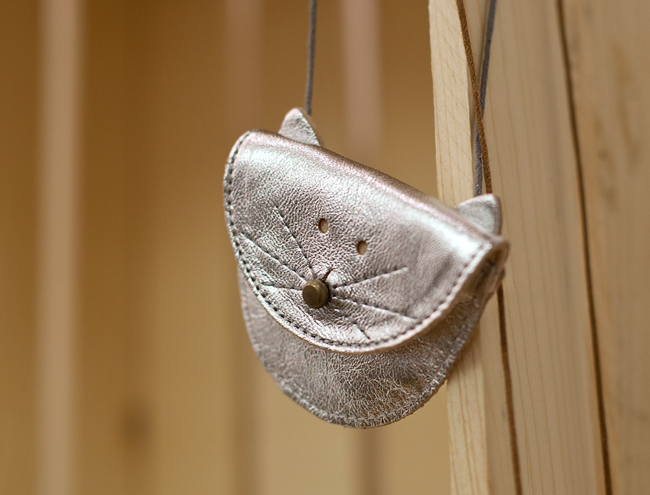 MI & ME - Based in Omaha, Nebraska, Mimi of MI & ME designs and sews each piece by hand with a keen attention to detail. From every seam, to intricate filigree snaps, Mimi's creations are sure to delight little ladies. 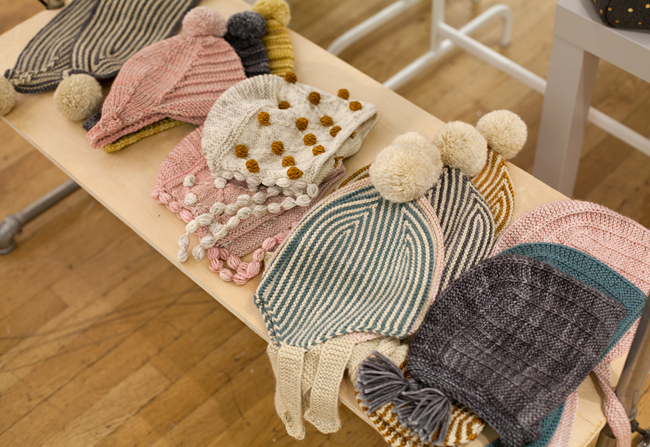 DONSJE - Founded by Florentine van Oosten Slingeland in 2013, Amsterdam based brand of hand-made baby and toddler booties, warm leather hats and adorable accessories. All Donsje products are made to high standards. 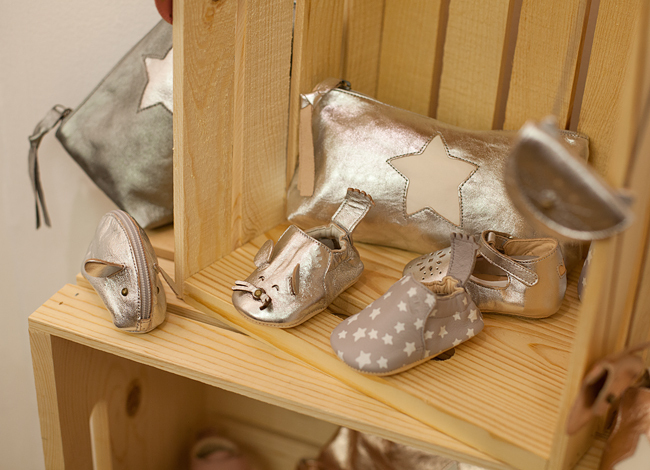 The shoes are super soft and flexible, perfect for first-walkers and the hats and little purses are full of whimsy.